bin2xml is an attempt at a completely generic, configureable file parser, mainly aimed at binary input data. It uses an XML definition file to attempt to decode an input file into "packets", then wraps those up in XML structures for output. Optionally, it can use an XSL stylesheet to transform the XML before it gets output. By default, a generic "default.xsl" and "default.css" style combination will be used, which generates the red tables shown on this page. The definition file contains one or more "templates", which define the data layout for a type of data packet. bin2xml will try each one of these templates in turn (in the order they appear in the template file), and if one of the templates matches, then the data will be parsed into it. A populated XML structure is then generated, which is the same as the template used, but fully populated with the input data. The format for the template file is described in full in writing_templates.txt. bin2xml is written in Python, so it isn't going to break any records for sheer speed, however the advantage is it was easy to write (taking a few days) and is incredibly flexible. I think the functionality is best demonstrated by example, so the remainder of this page is devoted to usage and output examples. The code is available from the navigation bar on the left. The University of Surrey and SSTL recently launched a nanosatellite called STRaND-1, which carries a Google Nexus One as one of its payloads. The satellite (at the time of writing) is broadcasting a telemetry beacon which can be picked up by amateurs according to the details here. The broadcast is in KISS/HDLC packets, which are not human-readable, so bin2xml can be used to decode them. 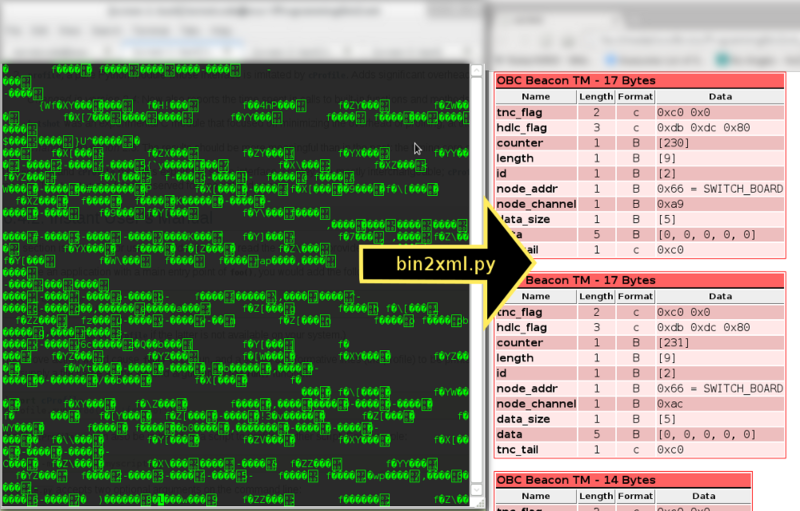 This describes the OBC beacon packet, and you can see that some fields have defined data (such as the tnc_flag and tnc_tail) and others do not. These will be filled, if the input data matches the packet format. Also note that the data field is variable length, taking its length from the data_size field. Which I think you'll agree is much more readable than '\xc0\x00\xdb\xdc\x80T\t\x02f\xac\x05\x00\x00\x00\x00\x00\xc0'. "Mar 10 11:30:48",    "eva",    "",    "kernel:",    "[",    "1481374.362963",    "]",    "ata3.00: configured for UDMA/100",    ""
"Mar 10 11:30:48",    "eva",    "",    "kernel:",    "[",    "1481374.363209",    "]",    "sd 2:0:0:0: [sdb] Starting disk",    ""
"Mar 10 11:30:48",    "eva",    "",    "kernel:",    "[",    "1481374.410895",    "]",    "PM: resume of devices complete after 5439.932 msecs",    ""
"Mar 10 11:30:48",    "eva",    "",    "kernel:",    "[",    "1481374.410970",    "]",    "PM: Finishing wakeup. ",    ""
"Mar 10 11:30:48",    "eva",    "",    "kernel:",    "[",    "1481374.410971",    "]",    "Restarting tasks ... done. ",    ""
"Mar 10 11:30:48",    "eva",    "",    "kernel:",    "[",    "1481374.568320",    "]",    "r8169 0000:07:00.0: eth0: link down",    ""
"Mar 10 11:30:48",    "eva",    "",    "kernel:",    "[",    "1481374.568363",    "]",    "r8169 0000:07:00.0: eth0: link down",    ""
"Mar 10 11:30:48",    "eva",    "",    "kernel:",    "[",    "1481374.568481",    "]",    "IPv6: ADDRCONF(NETDEV_UP): eth0: link is not ready",    ""
"Mar 10 11:30:50",    "eva",    "",    "kernel:",    "[",    "1481376.165066",    "]",    "r8169 0000:07:00.0: eth0: link up",    ""
"Mar 10 11:30:50",    "eva",    "",    "kernel:",    "[",    "1481376.165073",    "]",    "IPv6: ADDRCONF(NETDEV_CHANGE): eth0: link becomes ready",    ""
Of course, there are much better tools for parsing text files (especially kernel logs! ), but when all you have is a hammer... The point was to show how flexible bin2xml can be with the right configuration files.